Many cracks and variations. On the first pitch of the standard right start, climb a thin crack and make a balancy and reachy step right. Hand jams lead to a 5.11a finger lock/reach crux. Take a few laps. The second pitch is rarely climbed. Steep 5.9 hands and face up to a 5.11b fist and lieback roof to a 5.9 offwidth. Then a final 5-foot roof (reach for the rail). A big reach to a small dike gets you over to the anchors. FA: Dario Gambetta, Tony Yaniro, 1978. 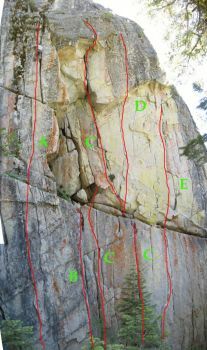 5.10c crack variation -Strenuous jamming with rests. Well-protected. Stay right of the corner. 5.9 corner variation -Fun stemming and jamming. Most climbers lead this pitch, then toprope the cracks to the right. Which SuperTopo guidebooks include a topo for God of Thunder? Route A in the photo.